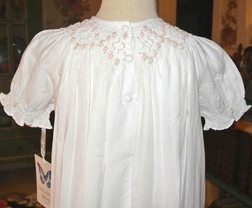 We absolutely adore this new heirloom smocked dress by Highland Porch~Lisa Anne! 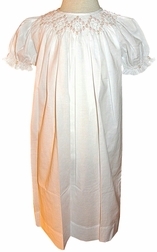 The dress is made from white cotton batiste fabric and includes an underslip for modesty. 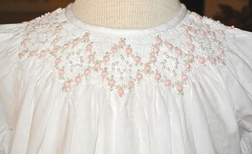 The dress is smocked around the neck and is embroidered with pink rosebuds and bullions with little pearls for additional beauty.